In an excessive use of lethal force, on Monday, 30 September 2013, Israeli forces killed a Palestinian civilian, and wounded another one before arresting him, near the border fence, east of Beit Hanoun in the north of the Gaza Strip. According to investigations conducted by PCHR and the testimony given by Naim Khalil, an ambulance officer in the Palestine Red Crescent Society (PRCS), at approximately 19:15 on Monday, 30 September 2013, sounds of artillery shells and flash bombs that were followed by heavy gunfire were at the border fence, east ofal- Misreyin Street in the east of Beith Hanoun in the north of the Gaza Strip. At approximately 20:00, the International Committee of the Red Cross (ICRC) informed the PRCS in Jabalia that there was a body of a Palestinian civilian near the border fence. 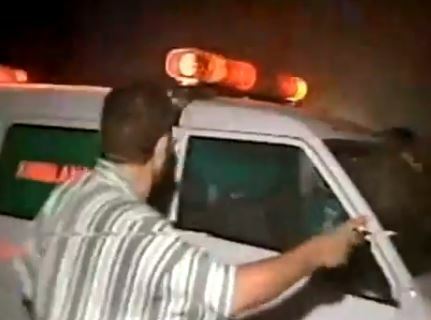 After coordinating with the Israeli side, an ambulance of the PRCS headed to the above-mentioned area, and the paramedics started searching for the body . After approximately 20 minutes of search, they found the body of the killed man who was lying on his stomach about 400 meters far from the border fence . The victim was hit by several bullets in the back and one bullet in the back of the head, and was wearing civilian clothes and possessing no equipment. The search process continued till 21:50, as the paramedics were informed that there was another person in the area, but they didn’t find anyone, before their director called them and asked them to evacuate the area for there was nobody else there. The paramedics took the body to Kamal Odwan Hospital in Biet Lahia, where the victim was identified later as Hweishel Ismail Hweishel Hanajra, 35, from al-Bureij refugee camp in the central Gaza Strip. The victim’s family stated to a PCHR fieldworker that their son had headed to the area in order to infiltrate into Israel to find a job, as a result of his difficult living conditions. The PCHR fieldworker was informed that Israeli forces advanced into the area immediately after the incident, and chased and arrested a wounded man. According to the ICRC, the detainee is Subhi Hussein Salem Abudib, 36, from al-Bureij camp. Moreover, the artillery shelling caused material damage to Musleh Al-Tarabin’s abandoned house that is covered with tin plates, located about 700 meters far from the border fence; cracking its walls, damaging 4 water barrels, punching tin plates, and killing birds and a donkey. PCHR expresses deep concern for such crimes which reflect the continued use of excessive force by Israeli forces against Palestinian civilians in disregard for their lives, and points out that the infiltrations through the border fence along the Gaza Strip are repeated due to the crippling economic blockade in Gaza. PCHR calls upon the international community to take immediate and effective actions to put an end to such crimes and reiterates its call for the parties to the Fourth Geneva Convention 1949 to fulfill their obligations under Common Article 1; i.e., to respect and to ensure respect for the Convention in all circumstances, and their obligation under Article 146 to prosecute persons alleged to commit grave breaches of the Fourth Geneva Convention. These grave breaches constitute war crimes under Article 147 of the same Convention and Article 85 of Protocol I Additional to the Geneva Conventions. Israeli forces committed 15 violations against Palestinian journalists in the West bank and Gaza Strip, according to the monthly report of the Government Media Office. 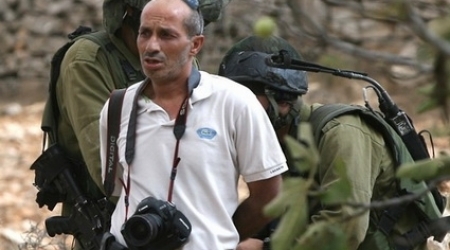 The report mentioned that the Israeli soldiers arrested journalist Mahmoud Abu Al-ata , worked as a Director of media dep. at Al-aqsa Channel, from inside Al-aqsa Mosque and detained the journalist Sabrin Dyiab, from Jerusalem, for interrogation. 12 journalists were injured, during dispersing rallies, whether by rubber coated bullets or gas bombs. Israeli forces also prevented journalist Mohammed Shtawi, from the Gaza Strip, from travelling to Jordan for treatment despite obtaining referral report from Ministry of Health. Since the beginning of 2013 , 139 violations against journalists have been reported; including detention , physical assaults and prevention from practising their jobs. The Palestinian journalists called International the Federation of Journalists for protecting them and put an end for the repetitive violations . In its monthly report, Ahrar Center for Detainees Studies and Human Rights documented the Israeli arrests ad violations in West Bank and Gaza Strip during September. 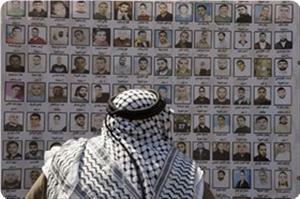 The report said that 278 Palestinians have been arrested and two others were killed by Israeli soldiers. The highest numbers of detainees during September were from al-Khalil, where 81 arrests were reported. Meanwhile, 62 Palestinians were detained in Jerusalem, while 32 others were from Nablus, 30 detainees were from Bethlehem, 28 arrests in Ramallah, while 17 arrests were made in Jenin. In Qalqilya 11 arrests were documented, 7 other cases were in Salfit, and 5 detainees in Tulkarem, while only 3 arrests took place in Gaza. Ahrar center reported that 21 arrests were carried out at Israeli military checkpoints and border crossing 9 children under 15 years old were among the detainees in addition to two women. In the same context, the center's report documented the arrest of one Palestinian journalist Mahmoud Abu Atta, from Jerusalem, who was arrested on 24/09/2013. Abu Atta is the director of the media department at Al-Aqsa Foundation for Endowment and Heritage in Jerusalem. Meanwhile, the report said that two Palestinians were killed including one from Jenin refugee camp, after being arrested while bleeding, in addition to another martyr from the Gaza Strip due to shelling. Palestinian Prisoners Society (PPS) said that Israeli authorities have renewed the administrative detention sentences for 38 prisoners during September 2013, including 28 prisoners from Hebron governorate. 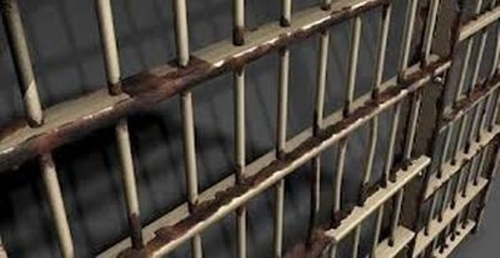 According to PPS, 16 prisoners were sentenced to six months in administrative detention, 14 prisoners were sentenced to four months, seven prisoners were sentenced to three months and one prisoner was sentenced to two months. The Palestinian Ministry of Detainees and Ex-detainees said that the Israeli forces arrested 10,000 Palestinian since the outbreak of second Intifada in September 2000. The ministry said in a report on the occasion of the 13th anniversary of the second Intifada, also known as the Al-Aqsa Intifada, that Israel is holding 250 children in prisons and detention camps in Israel and in the West Bank. The Al-Aqsa Intifada broke out in Sept. 28, 2000, following a visit by Israel's then-opposition leader Ariel Sharon to the Al Aqsa Mosque. The ministry said that 90 percent of the children were arrested from their homes during arrest campaigns that the Israeli army usually carries after midnight. The ministry added that the majority of them were forced to sign confessions written in Hebrew. 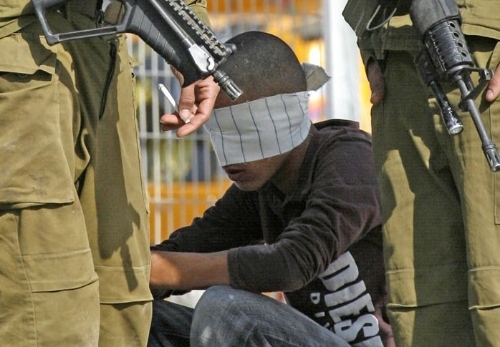 According to the ministry, "the Palestinian children are staying in very difficult circumstances in Israeli jails, are being violated during their arrests, during their interrogations and during their court proceedings." It added that the Israeli Prison Service "put them under psychological pressure and some jailers molested some of the children." The ministry said that "holding Palestinian children in Israeli prisons violates the Article 76 of the Fourth Geneva Convention, which prohibits an occupying power from transferring the population it is occupying to its own territory." It added that "incarcerating minors, especially holding them without charge in administrative detention, violates the United Nations Convention on the Rights of the Child." The official said that the Palestinian children still prosecuted at military courts that lack comprehensive fair trial and juvenile justice standards. According to recent Palestinian statistics, Israel is holding 5,100 Palestinian prisoners in its 17 prisons and detention camps in Israel and in the West Bank of whom 234 children, 15 females, 14 members of Palestine Legislative Council, 135 in administrative detention without trial and hundreds suffer from medical negligence. The Palestinian Central Bureau of Statistics issued a report about the situation of the elderly (60 years and over) in the occasion of the international elderly day October 1st. 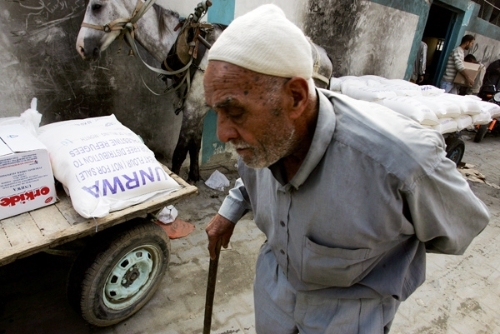 Elderly People in Palestine represent 4.4% of the total population in mid 2013. According to the report, Palestine witnesses improvement in life expectancy since the beginning of the last two decades. Life expectancy has increased about 5-7 years during the last two decades. In particular life expectancy increased for both males and females from 67.0 years in 1992 to 71.5years for males and 74.4 years for females in mid of the year 2013. The life expectancy is expected to increase during the coming years to reach 72.0 years for males and 75.0 years for females in the year 2015. The increase of life expectancy rate at birth resulted in the increase of the elderly number in Palestine which requires studying and researching the elderly situation in Palestine. The Palestinian society is considered a young society where the percentage of youth is about half of the society and the percentage of the elderly is relatively small. In mid of the year 2013, the percentage of the elderly (aged 60 and over) reached 4.4% of the population in Palestine(4.8% in West Bank and 3.7% in Gaza strip). Even though, the percentage of the elderly will be increasing during the coming years in Palestine, their percentage will stay relatively low not exceeding 4.5% during the upcoming 10 years. The elderly percentage may start increasing after year 2020. The percentage of males (aged 60 and over) in Palestine reached about 3.9% in 2013 against 4.9% for females (81.4 males against 100 females). The percentage of households headed by an elderly person in the 2nd quarter of 2013 reached 15.7% in Palestine(17.1% in West Bank and 13.2% in Gaza Strip). The data indicates that the average size of the households headed by an elderly person is relatively small reached 3.5 individuals against 5.9 for the households not presided over headed by an elderly person in the 2nd quarter of 2013, (3.3 individuals for the household in West Bank and 4.1 individuals for the household in Gaza Strip). About 91.6% of the elderly males in Palestine are married against 44.4% of the elderly married females. The percentage of the elderly widowed males reached 8.3% against 48.1% for females in the 2nd quarter of the year 2013. The percentage of the elderly participation in the labor force reached about 12.5% of the total labor force in Palestine during 2nd quarter of 2013, (14.2% in West Bank and 9.0%. in Gaza strip). The percentage of the unemployed elderly in Palestine reached 3.3% (3.9% in West Bank and 1.3% in Gaza strip). The percentage of the unemployed elderly males reached 3.9%. Data also indicates that 54.1% of the working elderly are self-employed; while 18.4% are paid employees. Data indicates that there is a high percentage of illiterate elderly in 2012. The percentage of the elderly who have not completed any educational stage reached 54.8% (34.6% males and 71.1% females), and the percentage of illiteracy rate for elderly is 37.7% of the total elderly persons. 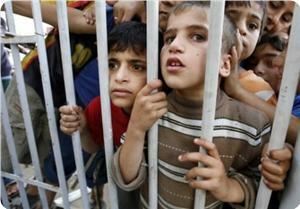 They represent about 68.1% of the illiterate persons in Palestine. The percentage of the elderly who obtained diploma and higher is 10.7% in Palestine. Data on illiteracy of 2012 indicates that there is an obvious difference between males and females in receiving education where the percentage of the elderly males who have obtained a diploma and higher reached 17.7% against 5.1% for elderly females. Needless to note that the illiteracy percentage of individuals aged 15 and over does not exceed 4.1% (1.8% males against 6.4% females). The percentage of individuals (aged 15 and over) who obtained diploma and higher reached 16.9% of total population aged 15 and over in Palestine (17.4% males and 16.4% females). In its Weekly Report On Israeli Human Rights Violations in the Occupied Palestinian Territories for the week of 19- 25 September 2013, the Palestinian Center for Human Rights (PCHR) found that during the reporting period, Israeli forces wounded 14 civilians, including 4 children and 2 photojournalists. 2 Palestinian civilians were wounded in the east of Jabalia in the north of the Gaza Strip. In addition, a Palestinian child was wounded in the centre of Hebron, and 11 civilians were wounded during weekly non-violent protests. Israeli forces conducted 62 incursions into Palestinian communities in the West Bank. 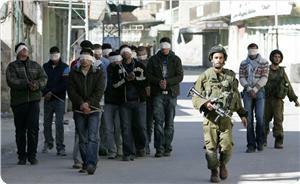 At least 45 Palestinian civilians, including 1 child, were abducted in the West Bank. Israeli forces established dozens of checkpoints in the West Bank. At least 6 Palestinian civilians, including 3 children, were abducted at checkpoints in the West Bank. On 22 September 2013, a Palestinian boy was wounded in Hebron when some boys gathered and threw stones at Israeli soldiers stationed at the entrance of al-Shuhada' Street, south of the Old Town of Hebron. The Israeli soldiers fired sound bombs, tear gas canisters and rubber-coated metal bullets in response. As a result, a 16-year-old civilian was wounded by a rubber-coated metal bullet in the right thigh. Following the killing of an Israeli soldier on 22 September 2013, Israeli forces carried out a series of collective punishment measures against Palestinian civilians in the city. They deployed between houses in the centre of the Old Town and declared the area a closed military zone. They raided many houses in different neighbourhoods, including Abu Snaina, Jabal Jawhar, Qatyoun, Jaber neighbourhood, Tal'at Abu Hadeed, al-Karantina, the vicinity of the Ibrahimi mosque and the vicinity of Tareq Ben Ziad School. Israeli forces also searched the houses, and damaged their contents. They kept their occupants in a room and took others to the vicinity of the above-mentioned school. In the meantime, Israeli forces stationed atop of a number of houses and turned them into military sites. Moreover, they informed occupants of those houses of the decision to seize the houses for military reasons. Israeli forces closed all entrances leading to Hebron and erected checkpoints. They also completely closed the entrance of al-Harayeq road linking Hebron with its southern villages. Israeli forces detained dozens of Palestinian civilians around Tareq Ben Ziad School and released them later, excluding 7 ones who remained in custody. In the Gaza Strip, on Friday, 20 September 2013, 2 Palestinian boys were wounded when Israeli forces stationed along the border fence to the east of al-Shuhada' cemetery, east of Jabalia, opened fire at a group of young men, who were about 100 meters away from the fence. In the Gaza Strip, on 24 September 2013, Israeli forces carried out 2 limited incursions. They moved about 200 meters into the east of al-Qarara village, east of Khan Yunis, in the southern Gaza Strip. Moreover, Israeli forces moved about 200 meters into the west of the border fence, east of al-Salqa valley, east of Deir al-Balah. In both incursions, they levelled lands along the border fence and withdrew later. Israel has continued to impose a total closure and has isolated the Gaza Strip from the outside world. Israeli forces have continued to support settlement activities in the West Bank and Israeli settlers have continued to attack Palestinian civilians and property. Settlers moved into many areas and performed their Talmudic rituals. 2 researchers from B'Tselem were attacked and their cameras were damaged in Hebron. 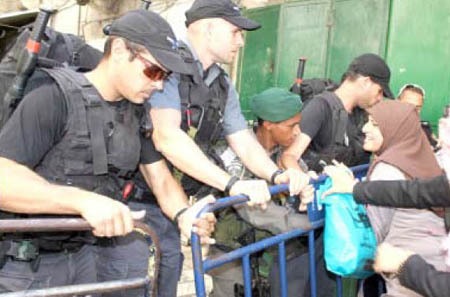 Settlers seized a house in the Old Town of Hebron. On 20 September 2013, under the protection of Israeli forces, about 300 settlers from "Efrat" settlement in al-Khader village, south of Bethlehem, moved into Suleiman Pools area between Artas and al-Khader villages. They performed their Talmudic rituals around the pools celebrating the Jewish holiday of "Sukkot". On 21 September 2013, under the protection of Israeli forces, a group of settlers moved into Silet al-Daher village, south of Jenin, where "Homesh" settlement used to stand. Local sources stated to a PCHR fieldworker that dozens of settlers arrived at the area by buses with the company of Israeli forces. They performed Talmudic rituals and established tents. They withdrew later and no further incidents were reported. The settlers did the same approximately 13:00 on Sunday, 22 September 2013, as well. On 22 September 2013, 3 settlers coming from "Havat Ma'oun" settlement outpost, east of Yatta, damaged 2 olive trees belonging to Rab'i family in al-Hamra area, west of al-Tawani village, east of Yatta, in the south of Hebron. On the same day, settlers from "Havat Gilad" settlement in Jeet village, northeast of Qalqilia, moved into lands called al-Jorfah around the aforementioned settlement, north of the village. They damaged and destroyed about 30 fruitful olive trees and burnt a digger used to dig wells. They also stole the iron head of the digger. On the same day, a number of settlers coming from "Kiryat Arba" settlement, east of Hebron, seized a house belonging to al-Rajabi family in Wadi al-Husein area. Israeli settlers stationed in the building prevented them from entry. In the meantime, other settlers walked in the streets of al-Ja'bari neighbourhood and chanted racist slogans against Arabs. On 23 September 2013, a number of settlers gathered in front of "Gosh Etzion" settlement complex, south of Bethlehem, and chanted slogans for revenge against Arabs. On the same day, settlers from "Ma'ale Gilboa", "Joshua King" and "Merav" settlements that are established on lands of Jalaboun village, northeast of Jenin, stole the olives belonging to residents of Jalaboun village. On the following day (Tuesday, 24 September 2013) a number of settlers from the above-mentioned settlements were present on Palestinian farmlands and damaged a number of trees. On Monday also, a number of settlers from settlements outposts in the Old Town of Hebron attacked Palestinian houses with stones and empty bottles in Qatyoun, Tal al-Rumaida, Jaber and Wad al-Hussein neighbourhoods while Israeli forces were watching. On the same day, a group of settlers from "Ramat Yishai" that is established on lands of Tal al-Rumaida neighbourhood, south of Hebron, attacked the family of Emad Awni Abu Shamsiya (40) and 2 researchers from B'Tselem: Mousa Mahmoud Abu Hashash and Manal No'man al-Ja'bari. Israeli forces damaged cameras of the researchers while they were filming settler attacks on a group of international activists. On the same day, a group of settlers raided a house belonging to the family of Ali Abu Rajab in the vicinity of the Ibrahimi mosque, in the centre of the Old Town of Hebron. They raised the Israeli flag in front of Israeli soldiers and prevented the house’s owner and his 7-member family from moving inside. At approximately 02:00 on Tuesday, 23 September 2013, Israeli forces obliged the settlers to leave the house. As a result, the settlers established a tent in front of the house and raised the Israeli flag. Moreover, they fixed posters at the entrance of the house and fences of parks around the Ibrahimi Mosque and al-Fayha' School on the settlers' right to possess the house. In addition, they performed religious rituals there, while Israeli forces prevented the Palestinian family from leaving the house. On 24 September 2013, dozens of settlers from "Adora" settlement, west of Hebron, organized a march marking the Jewish holiday of "Yom Kippur". They made their way towards al-Nabi Saleh area, west of Ethna, and Ein Fer'a near Tafouh village, west of Hebron. On the same day, dozens of settlers from settlements built on lands east of Yatta organized a march marking the Jewish holiday of "Yom Kippur". They made their way around villages threatened to be confiscated in the southeast of Yatta, in al-Musafer area. They also went to al-Karmel, al-Baraka and Kherbet Sousia, where they performed their rituals and chanted slogans against Arabs. Also on the same day, under the protection of Israeli forces, a group of settlers moved into al-Hafira area between 'Arraba and Marka villages, southwest of Jenin. They performed religious rituals near and archaeological site and stayed there for some time, after which they withdrew. During the reporting period, Israeli forces continued the systematic use of excessive force against peaceful protests organised by Palestinian, Israeli and international activists against the construction of the annexation wall and settlement activities in the West Bank. As a result, 11 civilians were wounded during 2 peaceful protests in Bil'in village, northwest of Ramallah, and Kofur Qaddoum village, northeast of Qalqilia. Furthermore, dozens suffered tear gas inhalation and other sustained bruises. 6 civilians were wounded in Kofur Qaddoum protest and the 5 others were wounded in Bil'in protest. At approximately 12:30, on Friday, 20 September 2013, dozens of Palestinian civilians from Kofur Qaddoum, northeast of Qalqilia, and international activists gathered and made their way through the eastern entrance of the village in protest at closing that entrance with an iron gate since al-Aqsa Intifada. Israeli forces fired tear gas canisters indiscriminately. As a result, dozens suffered tear gas inhalation and 6 others, including a child, an Israeli activist and a Chinese photojournalist, sustained wounds as they were directly hit with gas canisters. The Israeli activist Shaul (30) was hit by a tear gas canister to the right shoulder, correspondent of the Chinese News Agency Sam (35) was hit by a tear gas canister to the left leg and Ayman Edris (25), a photojournalist at Ramsat company, was hit by a tear gas canister to the chest. Moreover, a 15-year-old child was hit by a tear gas canister to the right shoulder, a 36-year-old civilian was hit by a gas canister to the left shoulder and a 22-year-old civilian was hit by a gas canister to the right leg. (PCHR keeps the names of the wounded Palestinians). Following the Friday prayer, 20 September 2013, dozens of Palestinian civilians and international and Israeli human rights defenders organised a peaceful demonstration in Bil'in village, west of Ramallah, in protest at the construction of the annexation wall and settlement activities. The demonstrators raised the Palestinian flag and made their way towards the annexation wall. Israeli forces closed the wall gate with barbwire and when the demonstrators attempted to access the lands behind the barbwire, they were stopped by Israeli soldiers. The demonstrators threw stones at the Israeli soldiers who responded with live ammunition, rubber-coated metal bullets, sound bombs, and tear gas canisters, and chased them across olive fields as far as the outskirts of the village. As a result, 5 protestors, including 2 children, a Swiss activist and a photojournalist of the popular committee against the annexation wall and settlement activities in Bil'in, sustained wounds. In addition, dozens suffered tear gas inhalation and others sustained bruises. A Swiss activist, Sarah John (30) was hit by a gas canister to the left leg, Hamza Suleiman Bernat (20), a photojournalist of the popular committee, was hit by a gas canister to the back, an 18-year-old civilians was hit by a gas canister to the back of his head, a 15-year-old boy was hit a gas canister to the left hand and a 17-year-old boy was wounded by a live bullet to the left thigh. Also, following the Friday Prayer, dozens of Palestinian civilians and international and Israeli human rights defenders organised a peaceful demonstration in Ni'lin village, west of Ramallah, in protest at the construction of the annexation wall and settlement activities. The demonstrators made their way towards the annexation wall. Israeli forces closed the wall gate with barbwire and, when the demonstrators attempted to access the lands behind the barbwire, they were stopped by Israeli soldiers. The demonstrators threw stones at the Israeli soldiers who responded with live ammunition, rubber-coated metal bullets, sound bombs, and tear gas canisters, and chased them across olive fields as far as the outskirts of the village. As a result, dozens of demonstrators suffered tear gas inhalation and others sustained bruises. Around the same time on Friday, dozens of Palestinian civilians, Israeli and international human rights activists gathered at the Martyrs Square in al-Nabi Saleh village, northwest of Ramallah, to hold a weekly peaceful protest against the construction of the annexation wall and settlement activities. The protesters walked towards Palestinian lands that Israeli settlers from the nearby "Halmish" settlement are trying to seize. From the morning, Israeli forces had closed all entrances to the village to prevent Palestinians, international activists, and journalists from joining the demonstration. Upon their arrival in the area, Israeli soldiers fired live ammunition, rubber-coated bullets, sound bombs, and tear gas canisters, chased the demonstrators into the village and sprayed them and civilian houses with waste water. As a result, dozens of Palestinians suffered tear gas inhalation and others sustained bruises. Also following the Friday prayer, dozens of Palestinian civilians, international activists and popular resistance activists gathered in al-Ma'sara village, south of Bethlehem, to hold a weekly peaceful protest called "The 31st anniversary of Sabra and Shatila massacre" against the construction of the annexation wall and settlement activities. The protestors made their way from al-Shomo' Cultural Centre, in the centre of the village raising the Palestinian flag. Upon their arrival near the annexation wall, Israeli soldiers fired sound bombs and tear gas canisters to disperse them. As a result, dozens of protestors suffered tear gas inhalation. However, no casualties were reported. A Palestinian official report stated that the Israeli forces arrested tens of thousands of Palestinians during the last thirteen years that followed the Al-Aqsa Intifada of September 2000. The Department of Statistics in the Ministry of Prisoners' Affairs said in a report released on Friday, "since the beginning of the second Intifada in September 28, 2000 and until today, the Israeli occupation forces have arrested about 80 thousand Palestinians." The report pointed out that among those arrested during the mentioned period are nearly 9,500 Palestinian children under the age of eighteen, about 60 MPs and former ministers, and more than 950 women, in addition to hundreds of wounded, patients, journalists, academics and leaders. It noted that the Israeli military courts have sentenced, since the start of the Aqsa Intifada, nearly 24 thousand Palestinians to administrative detention; without clear charges. The Department of Statistics added that the occupation has continued to detain about 5,200 Palestinian prisoners in 17 jails and detention center, including 13 MPs, 146 administrative detainees, 220 children and 13 women, all of them have been subjected to different forms of physical and psychological torture. The report stated that 81 prisoners were killed in the Israeli jails during the past thirteen years, as a result of torture or the deliberate killing, not to mention the policy of medical neglect adopted against the patients. It also stated that the occupation has deported 290 Palestinians from the West Bank and occupied Jerusalem to either the Gaza Strip or outside the Palestinian territories. The Palestinian Center for Human Rights (PCHR) considered that the Israeli limited facilities would not ease the siege imposed on the Gaza Strip since seven years. Israeli media sources declared earlier the Israeli intention to allow construction material for private projects into the Gaza Strip on Sunday for the first time in six years. 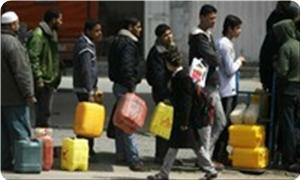 The sources said that 350 truckloads a week of gravel, cement and steel would be delivered to Gaza. The Palestinian Center for Human Rights confirmed that these "facilities" came to beautify the siege. PCHR called on the international community to pressure the Israeli authorities to remove the unfair siege on Gaza permanently as it constitutes a collective punishment that violates international laws. The center pointed out that the recent Israeli decision will not end the Palestinian people's plight where it will not allow the entry of the strip's humanitarian and basic needs especially the raw materials needed for construction projects. It will not also include exporting the strip products. The center stated that although the limited facilities the Israeli authorities continue to violate the international laws particularly the Fourth Geneva Convention related to the protection of the civilians at time of war. The Israeli authorities' decision to allow specific goods to enter into the besieged strip while continue to prevent other products would not ease the plight of the Palestinian people living in Gaza, the human rights center explained. PCHR confirmed that ending the plight of the Palestinian people in Gaza could not be achieved only by removing the Israeli siege completely and permanently. Israeli military forces should cease actions in a West Bank Bedouin community that were apparently intended to displace the residents without lawful justification. The military demolished all homes in the community on September 16, 2013, and blocked four attempts by humanitarian groups to provide shelters, with soldiers using force against residents, humanitarian workers, and foreign diplomats on September 20. Under international humanitarian law in effect in the occupied West Bank, the deliberate unlawful forced transfer of a population is a war crime. An Israeli court in August rejected a petition against military demolition orders by residents of Mak-hul and other Bedouin communities, on technical grounds. On September 24, more than a week after Mak-hul was demolished, the court temporarily suspended any further demolitions. Israeli forces demolished all 58 buildings in Mak-hul on September 16, displacing at least 48 residents, according to UN reports. The soldiers then blocked and confiscated two aid deliveries and demolished shelters built by another humanitarian group with the wreckage left over from the first demolitions, residents and humanitarian workers said. Numerous witnesses said that on September 20, Israeli forces threw “sound bombs” – disorienting, non-lethal grenades that make a loud noise on impact – at diplomats and aid workers attempting to deliver tents and other aid. Israeli forces also assaulted two Bedouin residents, who were later hospitalized, arrested three, and confiscated the truck and its cargo, witnesses said. On September 24, the Israeli High Court of Justice issued a temporary injunction, preventing the military from “transferring the [residents] from their village and demolishing the structures in the village,” unless demolitions were “required by imminent military needs and by clear operational security considerations.” The ruling gave the Israeli authorities until October 8 to show a valid legal cause to justify demolishing the structures in the community. As well as halting all demolitions in Mak-hul, the Israeli military should permit humanitarian assistance, and allow the community to rebuild, Human Rights Watch said. On August 25, the court had rejected a petition against the demolition orders in Mak-hul and in other Bedouin communities, ruling that the petitioners’ requests for building permits did not prove their connection to the land as required by Israeli military orders, and because not all of the petitioners shared a common legal claim. The ruling ordered the 21 petitioners to pay the Israeli authorities 10,000 Shekels (US$2,825). Residents said that since September 16, military officials have repeatedly told them to leave and not return to the site of the community. Israeli forces’ blocking of humanitarian assistance into Mak-hul for more than a week has deprived residents of adequate shelter in the community and food for their sheep, on which their livelihoods depend in a desert environment. The Fourth Geneva Convention prohibits “[i]ndividual or mass forcible transfers” of civilians within an occupied territory “regardless of their motive” except if carried out for the safety of civilians during hostilities or for imperative military reasons. Even when such forced transfer is permitted, it must be temporary and the residents allowed to return as soon as possible. Deliberatelyviolating this prohibition is a grave breach of the Geneva Conventions and is prosecutable as a war crime. Israeli officials justify demolitions of Palestinian structures not for security reasons or the safety of the population but on the administrative grounds that the structures were built without building permits, in areas not zoned for residential construction. Residents of Mak-hul said they had lived in the area since 1967, renting the lands from Palestinian landowners. In 2009, the Israeli military’s civil administration, which controls land use and planning in “Area C,” delivered “stop work” orders prohibiting any further construction in Mak-hul, residents said. Residents hired a lawyer in 2013, who notified them that the Israeli military said it had delivered demolition orders to them in 2012. But residents told Human Rights Watch that they had never seen the orders. Human Rights Watch has documented cases in other West Bank communities in which the civil administration left demolition and stop-work orders on rocks or suspended from tree branches rather than delivering them to homeowners. The International Committee of the Red Cross (ICRC) attempted to deliver emergency shelters that same day, but Israeli forces confiscated the shelters; aid workers were able to distribute only some hygiene and kitchen supplies, a spokesperson told Human Rights Watch. On September 17, the ICRC returned at 8:30 a.m. with a truck carrying tents, mattresses, blankets, and other supplies. Y. told Human Rights Watch: They set up two of the tents, and then the IDF [Israel Defense Forces] came. One of them said his name was Hamoudi and that he was in charge of the area. We sat in the two tents and the soldiers demolished them over our heads, by hand. The ICRC couldn’t stop them. They took the tents and put them in the personnel carrier, and they made the ICRC drive away the truck with the other tents. The ICRC spokesperson said that the IDF had confiscated emergency shelters and prevented the delivery of others. On September 18, a Palestinian humanitarian group sent workers who helped Mak-hul residents build shelters from scrap metal left by the original demolitions. At 7 p.m., Israeli forces returned and demolished three reconstructed shelters, residents said. Foreign diplomats visited the area to observe the demolition site on September 19. The following day, diplomats from Australia, Brazil, the European Union, France, Greece, Ireland, Spain, Sweden, the United Kingdom, and representatives from the European Community Humanitarian Office (ECHO) accompanied humanitarian workers attempting to deliver assistance to Mak-hul, according to witnesses and news reports. Israeli forces quickly arrived and ordered the workers not to unload the materials. There was no spark or triggering incident. The army had a lot of time, and they prepared stun grenades and threw them at the group of diplomats, aid workers, and residents around the truck…There was no need for using force. Two residents of Mak-hul were hospitalized after soldiers injured them during the confrontation. B. told Human Rights Watch that several soldiers pushed Ahmad Khalaf Salam Bani `Odeh, in his early70s, off the roof of a car he had climbed on during the confrontation; as of September 22, he was still in the hospital. Soldiers hit another resident, Muhammad Ali Mahmoud Basharat, in his 50s, in the face and stomach when he tried to intervene with soldiers who were arresting his two sons, Munzer, 22, and `Asem, 33, who remain in detention. Basharat was taken to a hospital and released the following day. Israeli forces also arrested Yusef Basharat, 35. It was not clear why the men had been arrested, but videos showed some men attempting to hold onto the truck with the humanitarian materials to prevent it from being confiscated. Now our sheep have been without shelter for days, they are in danger of dying. We’re being suffocated. There’s no security for me here. When the sun sets I feel frightened the army will come back. In May, residents said, the military burned the fields to the east of Mak-hul, making it impossible to graze sheep there as they had done in past years. The military considers the area surrounding Mak-hul to be a closed military area, to which it prohibits access. Mak-hul falls within an area of the West Bank that Israeli military authorities exclusively control, called Area C. Israeli authorities have zoned land in Area C, which comprises more than 60 percent of the West Bank, in ways that unlawfully discriminate against Palestinians. In practice, the Israeli military permits Palestinian construction in only 1 percent of Area C. By contrast, the military authorities have allocated 63 percent of that area to settlements, according to B’Tselem, an Israeli rights group. Israeli forces have demolished 524 Palestinian-owned structures in the West Bank, including East Jerusalem, since the beginning of 2013, displacing 862 people according to UN records. Deliberate and extensive destruction of civilian property, except when absolutely necessary for military operations, is also a grave breach of the Fourth Geneva Convention. The Palestinian Center for Development and Media Freedoms (MADA) condemned in a press release Wednesday, the attacks by the Israeli Occupation Forces (IOF) on journalists, by beating them, targeting them with sound bombs, and spraying them with blue colored waste water, during their coverage of the protests against the ongoing incursions of the Al-Aqsa Mosque, at The Damascus Gate in Jerusalem Tuesday 24th September 2013. Palestine Public TV cameraman Nader Baybars reported to MADA that no journalist was safe from the IOF attacks, and he stressed that the soldiers were brutal to the journalists, where they fired sound bombs and sprayed blue colored waste water at them. "The demonstrators and journalists were sprayed with blue colored waste water, and when we ran away I fell on the stairs and was bruised, many of my colleagues' cameras were damaged due to the waste water, such as Pal Media photographer Isaq Kasba (he was sprayed heavily with water) and Alquds newspaper photographer Suliman Khadir." Baybars added, "My Palestine Public TV coworkers Khalil Khadir and Mohamed A'shoo both got injured by sound bombs in their hands and were treated on site. Ahmed Albediri the correspondent of BBC suffered severe suffocation that affected his vocal cords by two sound bombs which landed between his feet, and he was transferred to a hospital for treatment". Diala Jwehan the correspondent of Alquds Net reported to MADA that the suppression of journalists was clear and direct while we were covering the protest and during the confrontations that followed and lasted for about 4 hours. Jwehan added: "We were pushed and beaten with batons, where we stood and formed a large group. Most of the journalists' cameras were damaged due to the water they sprayed on us". MADA stresses the need to hold the occupation accountable for its continued violations against journalists, and its violation of all international conventions and laws that protect journalists during their coverage of the events. 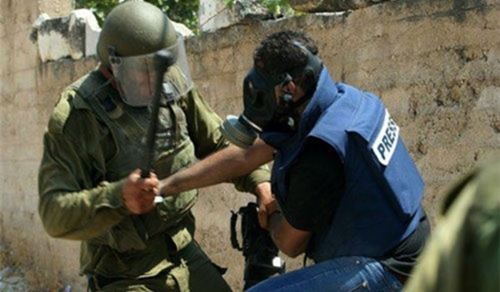 MADA calls on the international community to move quickly to protect Palestinian journalists. 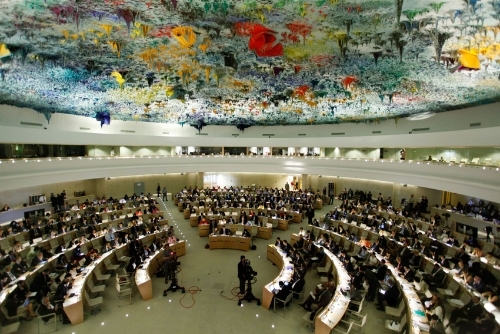 The United Nations Human Rights Council met Monday in Geneva to discuss the human rights situation in the Occupied Palestinian Territories, including East al-Quds (Jerusalem). UN Secretary General Ban Ki-Moon gave a report to the Council that addressed issues of settler violence, forced evictions and excessive use of violence by Israeli Occupation Forces. Other speakers addressed the “illegal conduct” of Israel in Gaza and the West Bank, and most called for Israeli settlement building to cease, according to the Jerusalem Post. Palestinian ambassador Ibrahim Khraishi said, “Israel continued its policies of deliberate violations of United Nations resolutions and international law, which were fully applicable in the occupied Palestinian territory.” He continued, saying, “The failure of the international community to ensure that Israel respected its international obligations jeopardized the credibility of international law.” Additionally, Khraishi called for an end to the Gaza blockade.